Over on twitter I swapped a couple of messages with the Bike Pure organisation and the result was that they got it from the horse’s mouth that Garmin-Transitions have a “no-needles” policy. For me this is something worth shouting about. 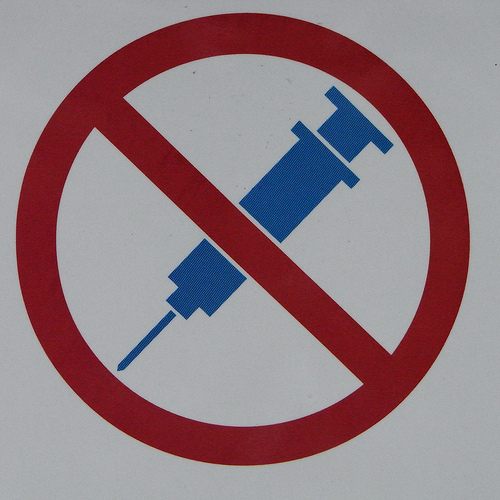 No needles means no vitamin injections, no IV drips to rehydrate or fill up with glucose. Apparently Footon-Servetto have a similar policy. Whilst these recovery techniques are legal, I salute the attitude taken by the Jonathan Vaughters. It’s very symbolic for a big team to abandon these methods, to say you can compete without these things. It’s a simple gesture that says so much. As a result, I’m now curious as to which other teams have the same attitude. I’m going to ask, I’ll email every UCI ProTour team and will await a response. Those that reply will be noted and I’ll come back with the responses on here in due course. Clearly my email address doesn’t end in lequipe.fr or wsj.com and so I imagine some teams won’t give instant replies. Similarly I won’t be hectoring them for responses, pestering them until they reply. But if a team wants to engage, I’ll highlight this. This is pretty interesting. I hope you get replies. Just curious to know what "the Bike Pure organisation" actually is. "They" barred me without comment from following their twitter account when I asked them this question directly. Same as Lance in that respect.